At the end of 2018, the Smoove bike sharing system was presented to the citizen by Mayor Jorge Munoz on 22th Nov 2018. SBP « Servicio de Bicicletas Publicas, CityBikeLima, is the first Smoove project in South America and we are very proud of it! Commercial launch will start early 2019! 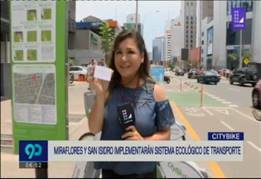 CityBike Lima on TV ! February 2019 !!! CityBike Lima is a service operated by Moventia and powered by Smoove !